Like in most other European cities in the late 19th century, Barcelona was growing and a lot of small villages in the surrounding were incorporated. A lot of upper class families saw their chance to expand their influence and began to demonstrate their power. As a result, a lot of impressive buildings were erected, but also housings for the migration into the growing city. All of this happened in a time, when rebellions were never far away and a lot of the new citizens became unhappy, because they couldn't find the promised jobs. 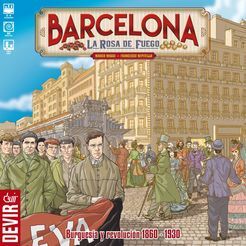 This is the background story of Barcelona – The Rose of Fire, a typical area control and tile placing game by DEVIR. In the game, each player acts as head of one of the prosperous families. 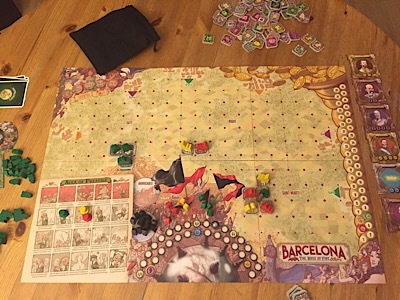 At the beginning of the game Barcelona is still a small town and it is the players' task to expand it to the smaller villages in the surroundings. So more and more buildings, symbolized by square cardboard city tiles are placed on the gameboard and whenever a new 2x2 city block has been completed, it is scored. This is normally the first thing we do in our turn: play an action card, take the appropriate city tile and place it on the board. The only thing you must consider when performing your action is that the new city tile must be placed next to another tile of the same colour. After that the player takes one of his buildings and places it on top of this city tile. There are four different types of buildings, beginning with a budget building complex and ending with an upper class domicile. 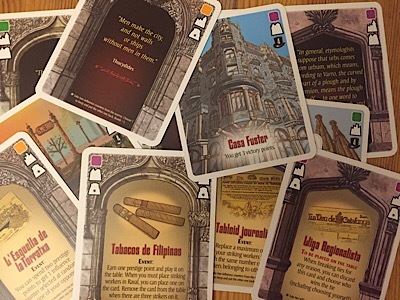 The card you have played for the city tile determines also the type of building you may take. But unfortunately history tells us also that growing is often combined with unhappy and disappointed people. This is the other part of the game. So in our third phase of the individual turns, we are forced to place striking workers, depending on the current immigration rate and the status of the building, in Raval in the centre of Barcelona, but also one of the poorest neighbourhoods. Each player has his or her own strikers. Five are allowed in Raval and can more or less be controlled, but as soon this number is exceeded, new strikers must be placed in the barricades where they organise the rebellion. Basically you can say: you can score more prestige by building better-up buildings, but on the other hand people will get unhappier, and, as a result, you have to place more striking workers too. The rebellion is the first thing we have to carry out at the end of each phase. All striking workers that are still in Raval are put in a bag. Soldiers in form of black wooden counters are added, depending on the number of players and the number of strikers in the barricades. 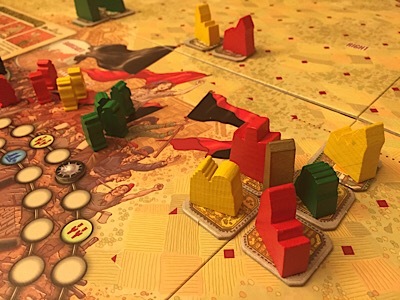 Then it is time for the rebellion: randomly, as many counters as the current immigration rate are taken from the bag and as a result, every player looses as many prestige as the number of his own striking workers. After that, new cards are dealt to the players and some more scoring takes place after each phase and after a period ends. Two phases are played in the first two periods, the last period lasts only one phase. Let us have a closer look at the action cards: we already have learnt about the city cards that are necessary to construct new buildings. Popularity cards can be played as normal city cards too, but they also have a special ability or can be played as an event. This sometimes can change a lot of the game, so it is important to find the right moment to play a card, especially because some abilities are triggered by the current position of the player on the prestige track. Influence can be gained by this way too. And it is especially this influence that can player boost to the top in the end game. You can use this influence to acquire influence cards for the final scoring at the end of the game. Remember that a lot of popularity cards can either played as city tiles or as event cards, for example to get influence. So you have to decide between building up the city in the early stage or gaining more influence and use it later in the game. On the other hand, all players have influence on how the social unrest evolves by playing more or less events. With each rebellion and every upper class building built the counter of the social conflict track moves further. 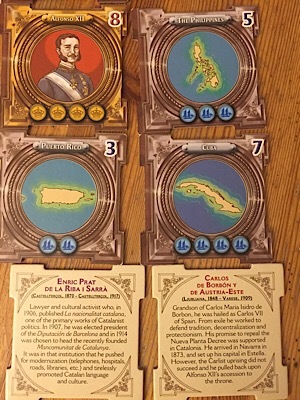 By this, disasters or smaller wars can be activated with the effect that part of the available influence cards are removed from the game. In the end, this can also end in a total anarchy, changing the scoring mechanic for the rest of the game. This, of course, can also be a strategy to win the game, because in an anarchy budget houses are much more worth than before. So players in Barcelona – The Rose of Fire can follow different strategies. Either you try to build more and more buildings, risking rebellions and pushing the social conflict. In this way, more and more influence cards become unavailable. On the other hand, you can play the game smoother, hoping to get those influence cards and to win in the end game. What is best to win the game not only depends on you (and your lucky hand while drawing cards), it is mainly dependent on your opponents moves. That's why I think the game is best with the maximum number of players (4), all of them knowing the game. Barcelona – The Rose of Fire looks very nice, all components are of good quality. Additionally, the game comes with a lot of explanation about the historical background. Each influence card and most action cards have an informative text part. It takes some time to find into the game, a lot of new players only concentrate on the building part fist. But that is not what the game is meant for. So you should try to get your fellow players excited long enough, so they can see what's behind all the influence and the more complex social conflicts.